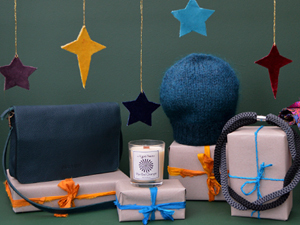 Yours Sustainably is the online destination for ethical, eco-friendly gifts. Chosen from around the world for their positive credentials, we are sure you will find plenty of inspiration amongst our newest home and fashion accessories. From Peru and Ecuador our new jewellery includes statement earrings and matching necklace carved from the tagua nut and hand enamelled earrings and necklace in a simple geometric shape, available in blue or pink. From Nepal we have an exciting range of beaded jewellery including dramatic chandelier earrings, roll-on bracelets and fun looped keyrings. Also new from Nepal our embroidered cross-body bag and hinged makeup/clutch bag will appeal to the eco-princess! The clever artists from ARTHOUSE UNlimited have collaborated on new designs for their bone china mugs, jugs and candles, this wonderful UK charity supports adults living with epilepsy and complex learning difficulties. For lovers of flowers and plants we have beautiful vases and planters, hand-made in India from recycled glass. New book titles from Tara Books, wooden number and alphabet jigsaws together with new designs in our eco-friendly bamboo dining sets will make great gifts for children. Finally, not forgetting the dog, we have a cute china dog bowl with humorous hand-drawn mutts, another brilliant ‘Gift That Matters’ from ARTHOUSE UNlimited.